, the younger, a noble Bolognese, was born at Bologna, Oct. 1, 1472. 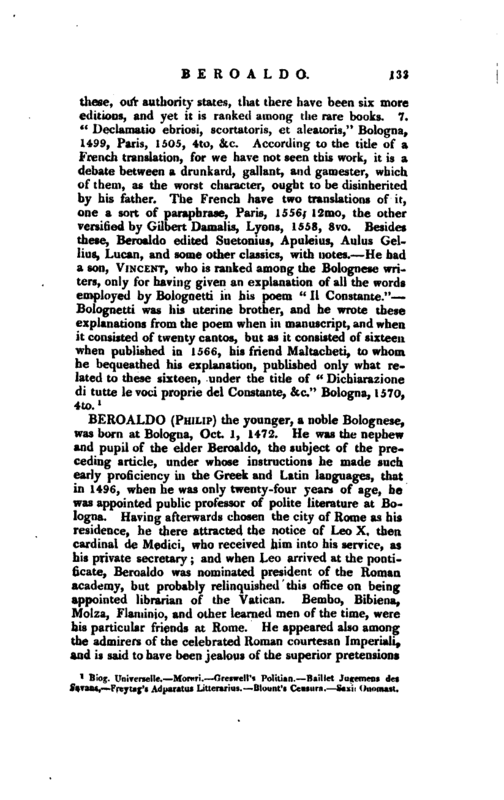 He was the nephew and pupil of the elder Beroaldo, the subject of the preceding article, under whose instructions he made such early proficiency in the Greek and Latin languages, that in 1496, when he was only twenty-four years of age, he was appointed public professor of polite literature at Bologna. 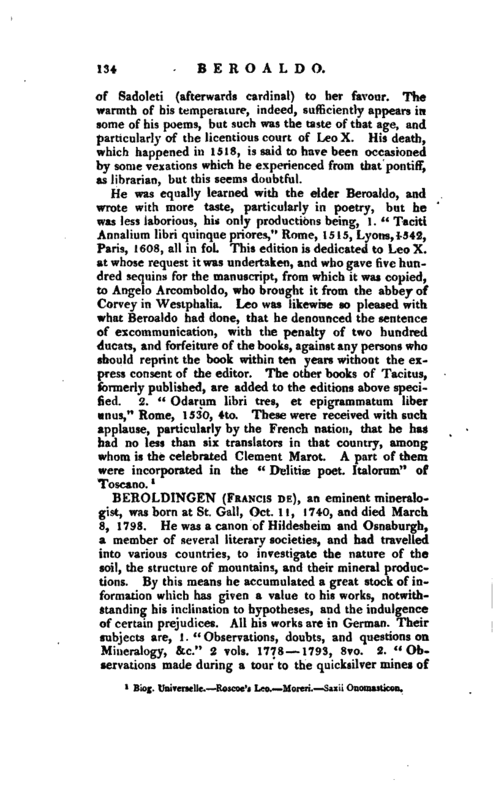 Having afterwards chosen the city of Rome as his residence, he there attracted the notice of Leo X. then cardinal de Medici, who received him into his service, as his private secretary and when Leo arrived at the pontificate, Beroaldo was nominated president of the Roman academy, but probably relinquished this office on being appointed librarian of the Vatican. Bembo, Bibiena, Molza, Flaminio, and other learned men of the time, were his particular friends at Rome. He appeared also among the admirers of the celebrated Roman courtesan Imperiali, and is said to have been jealous of the superior pretensions | of Sadoleti (afterwards cardinal) to her favour. The warmth of his temperature, indeed, sufficiently appears in some of his poems, but such was the taste of that age, and particularly of the licentious court of LeoX. His death, which happened in 1518, is said to have been occasioned by some vexations which he experienced from that pontiff, as librarian, but this seems doubtful. 1 Biog. Universellc. Rpscoe’s Leo. —Moreri. —Saxii Onomasticon.